It's been a long while since we took a break from real estate and posted a Baby Boomers feature. It was last weekend, that we learned about the sudden passing of Gordon Waller, one half of the 60's duo Peter and Gordon. 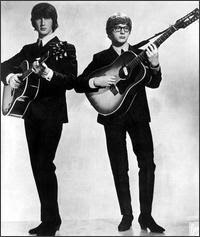 P and G were the first British band after The Beatles to garner a US # 1 hit, a distinction in itself. They had quite a decent run between 1964 and 1968. World Without Love (#1): Written by Paul McCartney, the performance looks to be from Shindig!, Nobody I Know (#12), I Don't Want To See You Again (#16), from The Ed Sullivan Show. 2 minutes and 15 seconds, written by Del Shannon.